The adoption of smartphones and tablets continues to accelerate in the United States. The mobile revolution has had a significant impact across verticals and will radically transform the way organizations operate. 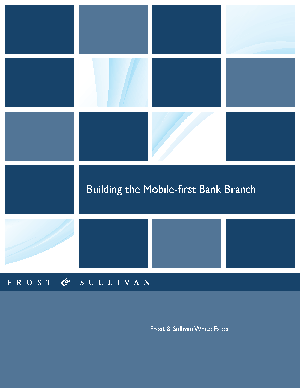 Frost & Sullivan research on the US mobile financial services market indicates more than 50% of all smartphone users and nearly 40% of tablet users use mobile banking services on their devices. In order for the financial services sector to keep pace with this growing global trend, the transformation from traditional branch banking to 'mobile-first' banking services is essential.